Ssangyong Motor Co.`s Rexton Sports. Ssangyong Motor Co., a South Korean unit of India’s Mahindra & Mahindra Ltd., narrowed its operating loss in the fourth quarter of 2018 and delivered its best-ever revenue thanks to brisk sales of its Tivoli crossover and newly launched Rexton Sports pickup. The Korean automaker in its earnings guidance on Thursday said it posted an operating loss of 3.48 billion won ($3.14 million) in the fourth quarter ended December, narrowed from the 25.7 billion won loss a year earlier. Sales were up 16.7 percent on year to reach 1.05 trillion won, a record quarterly high. Net loss also slimmed to 3.99 billion won from 30.2 billion won a year ago. Shares of Ssangyong Motor finished Thursday up 1.54 percent at 4,960 won. For the entire 2018, the company trimmed its operating loss by 1.69 percent on year to 64.2 billion won on a consolidated basis. Sales jumped 6.01 percent to 3.7 trillion won, an all-time high in its 65-year history. Net loss was also reduced 6.05 percent to 61.8 billion won. Strong demand for its flagship Tivoli crossover and the successful launch of the Rexton Sports pickup helped drive domestic sales for nine straight years, a company official said, making Ssangyong Motor the third-largest automaker in Korea by sales in 2018. Adding a new pickup model to the company portfolio proved to be a major boon. Released in January 2018, Rexton Sports’ domestic sales topped 40,000 units that year, delivering the best first-year results for a sport utility vehicle in the country to date. 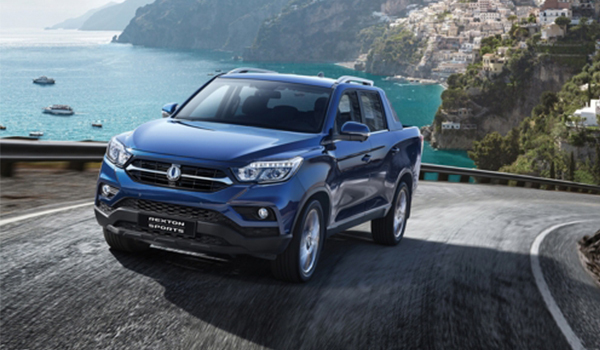 “We aim to swing to profit this year with a fresh SUV lineup that includes Rexton Sports Khan and the new Korando,” said Choi Jong-sik, chief executive of Ssangyong Motor. Executive Vice President Yae Byeong-tae would replace Choi as CEO once his term ends in March. Yae’s appointment would be put up for a shareholder vote at the end of March and later seek approval from the board.